Kate met with the medical staff who worked on the night of the attack, before meeting privately with the survivors. 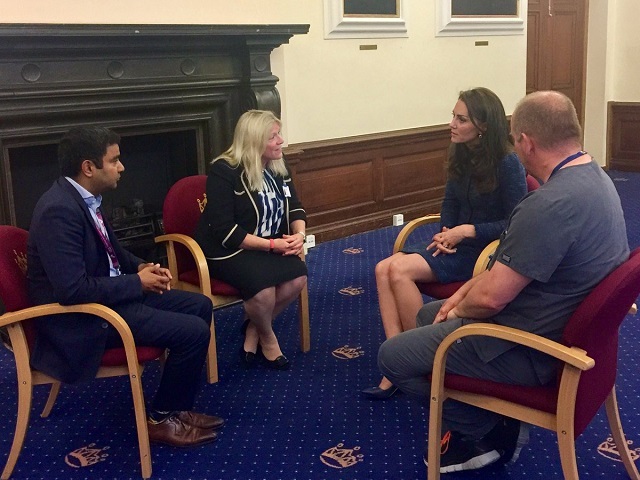 Kate then sat down with staff to talk about PTSD and trauma, and how important psychological support is for patients and staff. “Before she left, the royal met with other senior hospital officials including Dr Tunnicliff, who spoke to her about the psychological support which has been made available to staff and patients following the attacks… The issue of mental health is an important part of William, Kate and Harry’s public work. “The Duchess also asked whether PTSD is common among patients who have gone through such a traumatic experience. She was told that everyone was offered help and support both while in hospital and in the weeks and months ahead. I’ve seen on other blogs where people were questioning that Kate was supposedly surprised to learn that many of the victims had been women, but after reading the quote, it is unclear what Dr. Tunnicliff was saying Kate was surprised at because of the use of “that”. Was Kate surprised that the staff was shocked, or surprised that many victims were female? I don’t know. And since all I have to go on is the second-hand account, I’m going to take Dr. Tunnicliff literally and say that Kate was surprised that the staff was shocked. Kate wore her Rebecca Taylor blue sparkle tweed separates (the original, not the duplicate she debuted in February), and her Manolo Blahnik “Calogera” navy pumps (as far as I am aware, this is only their second outing after she wore them at the airport leaving for Canada in 2011). Kate also wore her Sapphire and Diamond Earrings. She did not carry a clutch. Additionally, Kensington Palace announced an engagement for Kate on June 16 – she will visit 1851 Trust at their final Land Rover BAR Roadshow – and the dates for the Poland/Germany tour – Kate and William will visit Poland and Germany from July 17-21, visiting Warsaw, Gdansk, Berlin, Heidelberg, and Hamburg. I wanted to express my appreciation for your posts about attempting to be just and fair in criticizing KM and the definitely dysfunctional RF. As an American who regards British royalty and aristocracy as an interesting carryover of an outmoded era, I consider KM to be a walking Barbie doll, and don’t take much of what she does or says very seriously. However, she and William certainly appear to live in a very cushy bubble but still think they ought to be taken seriously. It is refreshing to follow a blog that offers just critiques rather than gushing over her for what little she does compared to “ordinary” folks. After all these years as a member of the BRF and Kate comes up with “interesting”. You know how sociological studies show that someone with an attractive appearance of an “8” (on a 1/10) scale will choose a partner of equal attractiveness. I wonder if William knew he was a “4” as a working royal and picked another “4”. Kate still seems lost after all these years. I continue to follow her because she seems like an odd combination of full of herself and lost. Glad to see you back KMR. How many times have you warned us to behave? I will make an effort since you ask so little of us and give so much. Thanks! Kate’s public persona may be that of “walking Barbie doll”, and she has been criticized in the past by Hilary Mantel and Camilla Tominey for her lack of vibrant public persona, but we really don’t know what Kate is like in her real life. In terms of being taken seriously, I don’t think either William or Kate have shown the knowledge base to be taken seriously in the causes they choose to focus on. I think she is afraid to reveal too much of a personality for fear that it might be blown up, picked apart or otherwise taken out of context. If she’s fun, she’s not dignified enough for the position, if she’s reserved, she’s a robot. I’m not saying she can’t strike a balance but I know I probably couldnt. Her obsession with raising her waist shows in this outfit because it sits weirdly high especially when she is standing up. It’s also a heavy material for the season. I guess someone from KP was reading the blogs and the critiques of Kate not having done anything for either tragedy thus far. She looks a bit tan which may explain her absence. Better than nothing I guess, but still bare minimum. I thought the same thing. This sure seems in response to people noticing how she has disappeared for almost a month. Maybe KP figured she needed a more serious event before her fun one with Ben this Friday. I am glad she visited, but sadly I don’t give her props for this since it doesn’t feel genuine. Rather it just feels like PR to counter her lack of work and her apparent tan. I give props to the hospital works though for all they do. I don’t think Kate delayed in visiting victims any more than William did. In fact, there is a pattern of the higher ranked royal visiting first, 3 days after the attack, and the lower ranked royal visiting second, a week or so after the first visit. We could say that Kate should have visited Manchester, but Charles hasn’t visited Manchester either and no one is talking about that. You make good points, KMR. I’ll add some speculation: 1. Does Charles follow an event where the queen has presided? 2. Could the Cambs’ appearance be part of the royal and PR push to make them more front and centre?3. Is there anything that is not considered strategy for the BRF when it comes to public perception? I don’t mean to imply that the BRF doesn’t care about the causes they support, but in the end everything they do speaks to image management. I don’t say that cynically – it just seems to me that PR and ceremony are their chief functions. If W and K are the future of the monarchy then neither should be waiting that long for events like this. Kate’s disappearance looks worse though because no one had seen her since her sister’s wedding prior to this appearance. Charles and Camilla had been making appearances during all this time so it’s not like they were hiding at home like she was. Besides isn’t their issue mental health? I would think these victims might be in some kind of trauma after something like this. Yes, but I do think that staggering these visits over several weeks makes a lot of sense. The hospital staff were busy stabilizing critical care patients, and they shouldn’t have to be bothered with accommodating Royals at a time like that. And the patients themselves are much better served by long, restful periods of peace and quiet than the flurry of activity that comes with royal visits. I agree. Too early and you are interfering with recovery. Now is the right time as most are probably going to be discharged soon. Kate did discuss trauma and PTSD with the doctors and staff and whether the patients and hospital staff receive counseling after an event like this – I quoted that in the post. So she stayed on message re mental health when she asked about that. W&K are the future of the monarchy, but they are not the monarch nor the Heir Apparent. It makes total sense to me that W&K would go after HM and Charles. W&K went, though, instead of sending someone lower, signalling that they are the future after HM and Charles. Too little, too late. Very anticlimactic. Also, the queen was shown with victims, but this round is private due to the victims’ wishes? Truth, or PR to suppress her inability to look authentic? The fangirl part of me (if I had one) would have loved a pic of me and royalty to hit the news. I actually liked that the visits were spread out, for two reasons. The first, too many visits right after such an event puts a lot of strain on resources for the hospital and security. Second, if you’ve ever been stuck in a hospital for any length of time, you know that most people visit in the beginning and then the visits die down or disappear. This visit probably was more appreciated than if she’d gone the same day, or even a day after, the queen visited. Unfortunately, I thought her questions were vapid and forced and either highlight her very superficial understanding or complete lack of interest. It almost felt like she was trying to force this incident to fit into her narrative. But good for her for going, at least. I never thought about the timing before. Good points! Good to see you again KMR! Kate visited the London Bridge victims in a quicker time than William visited the Manchester victims – 9 days for Kate v 11 days for William. So I don’t think it’s too little too late, since the visit made people happy. And I wouldn’t want to be photographed while in a hospital bed and used for PR, so I don’t think it’s at all bad that the patient visit part was private. I think it was smart to have a private visit with the patients. These people have just been through a traumatic event, they don’t need cameras in their face so that Kate can look nice. I am sure they took pictures with her, but there is a big difference between a private picture and one put on the cover of newspapers. I don’t know if it’s because of the cut and paste, quick pace of the video or those it seem like she was there less than an hour… like a quick in and out visit. It seemed rushed to me. Like it’s something she just had to get done and over with. But in any regards I hope the visit, however short or long gave comfort and encouragement to the staff of the hospital. First responders, police and hospital staff have been the true heroes in every face of the recent terrorist attacks. Blessings for the victims and those who has help them. According to Twitter times, Kate was at this event for about 1 hour – her usual time spent at events. There were not a lot of photos, though, since the visiting with the patients part was private. The question of how much time the royals should spend at engagements gets brought up pretty frequently, at least with Kate, and sometimes I think it’s warranted to say that she should have stayed longer at certain events, or to question which events she stays longer at (like spending 2 hours at Downton Abbey whereas she usually only spends 1 hour at other engagements). But I think for this one, seeing at it was to a hospital where she was talking up time from the staff doing their jobs, I think it’s fine she stayed the usual 1 hour. OH i see, I fell like tumblr bloggers, making assumptions on 1/2 of information .. lol, I did not know that she spent time with the patience. The skirt just doesn’t seem to fit, has it been altered. I thought I liked this suit, though not so much it needed a duplicate, but now it just seems to tight and too short. Horrific terrible tower block fire in London overnight. There will be a lot dead and some terrible injuries. The hospital staff will be working hard to cope again. I saw on Twitter news about the fire. Gosh, the UK just can’t catch a break right now. I honestly thought the same thing when I saw that, this poor country is besieged from all directions. History shows GB will prevail, I have faith in the people ( and a massive soft spot, 3 of my grandparents are first gen Canadians- family hailing from the island and one directly from). Strong strong nation, my thoughts are on you always. I am in the UK, I can’t understand why things happen. I feel for the residents in those flats. Those poor families and what about the immobile. If there was a fire where my grandmother’s were when they were around I would be worried about them. The people that risk their lives for others. Really shows the quality of care. It has been shocking to read the reports. One can only wonder, as you said, why such things happen. Is it true the building had no sprinkler system? And, only one stairwell for so many residents? Also, to have put immobile elderly on such high floors, makes me wonder what anyone was thinking. And, the reports about the material that was put on the outside of the building. Was it really so flammable? I really am horrified. I know the people of Britain are brave and will persevere, but my heart goes out to all. Take care, Laura. Her newer RT blue tweed is much nicer imo, cut for better mobility and no chance of riding up too high in the back when she does her squat crouch. Glad she visited and on a superficial note I thought her hair looked gorgeous. Glad to have you back KMR. I am pleased the Duchess has paid a visit, this was very much needed. The support and kindness she can provide by visiting would not only boast the morale ,of the patients and their families, but also the staff. More of this would be terrific, but not just when a terrible incident occurs, random visits, to make a difference to patients who are ill and need all the good vibes and support then can get. Hospitals and sickness can be a very lonely world to be in. Of course the best place to be when needed. Best wishes to all who are in the process now of recovering not only physically but mentally. For the lives lost God bless them. So very sad for our Australian families who lost 2 beautiful women, we are thinking of you and to our neighbours our sincere condolences. I think Kate’s visit was an important thing to happen. The patients, their loved ones and the hard-working staff need to feel supported. I’m glad that she went. Also, terrible news concerning the fire and so many losses of life. London, Great Britain — under so many dark clouds. The heroic efforts of many are to be applauded. Could not believe someone caught that baby! My God. You are right Jenny, the selfless acts of bravery by many especially the folk on the ground watching helplessly, unbelievable. Such a terrible thing to happen. Oh the baby that is a heart stopping incredible stuff. Now that is to be admired, the courage that alone, must have taken. Great support is needed now, I hope the British R/F can help provide again, these are fellow country men, women and children. They are all in our thoughts. Bless them. Again, so true, Sophia. I cannot imagine the horror of being tapped inside the building. For all! And those brave first responders and ordinary citizens. To have caught a baby who was tossed out of a tenth floor window and for the baby to be ok. A miracle. I hope the mother is ok, too. Just a horrible situation and I also hope the Royals will pay homage to those who suffered and to those who helped. I read about the baby. For the man to catch the baby as he did. Yes I hope the mother made it out too and that the missing are found safe. It must have been awful. I am glad she visited them and I hope she brightened their day. The suit seems too thick for June, but maybe it was cold in London that day. KMR I am glad you are back and I am sorry that some people were horrible in the comments of your post about parenting. You run a brilliant and informative blog and I read it all the time! It was 17 degrees in London on Monday. So yes, a bit chilly. I am glad to read you this morning. I appreciate your blog. I would like to add without ignite again the discussion, that I found your article called “should we stop commenting on Kate parenting” very interesting, besides each of your point was very intelligently supported. I agree with the conclusion of your article. Well thought. I’m also very glad to see you posting again! I think you do a fantastic job with this blog, and I especially like how you manage to stay fair and balanced. I’m glad that Kate visited the hospital staff and patients. She did look rather tanned compared to her appearance at her sister’s wedding. Watching the video she still comes as across as so awkward . She practically ran away from the hospital director at the end. Maybe the Royal Family have been given some extra security warnings, what with recent events? She also needs to stop pushing her hands through her hair, especially when she’s shaking hands with other people straight afterwards. I’m glad Kate went, though I feel this is probably a reaction to her having done little in the last, what, month or so; she’s got the Ben Ainslie thing, Trooping the Colour, then what? I was not impressed by anything she was quoted as saying but that’s about the usual, I guess. I hope she made the patients and staff feel important. I’m sure they’re all being so well looked after and I hope they can all go home soon. Glad to see you back KMR. I was surprised that none of the BRF issued a statement after the London Bridge attack. I understand the idea of not wanting those statements to seem formulaic, but it looks worse to not say anything at all. Great to have you back KMR! I’m glad Kate visited with the hospitals. Although it seems a little late, I’m sure the staff and victims appreciated the visit so it’s great that she went. London needs all the positivity they can get right now. Kate’s visit was actually 2 days sooner than William’s visit to Manchester, so I don’t think Kate’s visit is too late. I think there is a set plan for when royals visit these things, and this was just Kate’s turn. I don’t know if it’s her stance or skirt but there’s something funky going on at her waist. The slit of the skirt made me gasp, it already looks short, can’t take how short it seems to be with the slit added. A little much for work, but it is Kate. I’m happy she did this visit! I’m sure she brightened everyone’s day, especially the victim’s. I’ve never been a huge fan of this suit since the first time she wore it, but she looks ok. I am happy she didn’t wear a repeat to this particular visit. I still don’t understand the point of royals and soft diplomacy and buttering up these countries in the face of Brexit negotiations. I just can’t imagine Angela Merkel is going to be like well you know I was going to play hard ball with Britain but now that Kate and William took time to visit I’m totally going to go easy on them!! Welcome back KMR – and thank you for your last post. I think the timing of this visit was appropriate (how sad that we have so many post-event timelines to compare to…). I also think that those who were injured impacts the private visit vs. the photographs of HMQ visiting the children hurt in Manchester. Happy to see Kate out and trying, the only way she’s gonna get better at this is to just keep plugging away. Some people just have that natural instinct/skill for dealing with this kind of life. Born with it or learn it. Its a struggle for her at times, but she seems to have a great support system. I agree nellebottomblues! Other members of the BRF have spoken about how terrifying their early engagements were but how, over time, they got better at them and a bit more comfortable doing them. It seems that Kate needs a bit of push out of her comfort zone, it’s only by going through the stress and coming out the other side do we grow and become more confident. I’m glad to see that Kate has lost her clutch and seeming to be improving her posture. Now once the finger-fiddling quiets down she’ll have a much better “presence”. But kudos to her for these improvements!! I’m not a huge fan of this suit, it’s a bit too juvenile and short for my taste, but she does have outfits that I dislike even more so I guess this one is okay. Actually, I think the skirt and jacket would look better paired with other items, for instance the skirt could be paired with a cream colored silk button up shirt and the jacket would look great with a pair of navy blue, straight-leg trousers. I would like to give Kate the benefit of the doubt and believe that this visit was planned some time ago, but I can’t shake the feeling that it’s in response to all the postings on various blogs. Even some of Kate’s most ardent fans were having a tough time excusing her absence. Personally I would have loved to see her visit the young Manchester victims, bringing along some art supplies because, as Kate believes, art therapy is so helpful especially to the young. She could have spent some time doing a bit art with the children and used all that she’s learned through her mental health work to get the children to talk a bit about their experience, their fears and their concerns. Since her, William and Harry are supposed to be the face of the “modern” royal family and are “keen” to do things their own way, why don’t they start doing some out-of-the-box visits? I’d love to see them do more than show up, shake hands, smile and leave. It was mentioned on other sites but I can’t tell, is Kate looking tanner here? Was she perhaps on vacation over the last couple of weeks? I was wondering if some of the delay in visits was because the London attack was so close to the election. I am not saying this to give the RF an excuse but because I am genuinely curious. I have always been amazed at elections in the UK because they get them done in such a short time as opposed to here in the US where the process takes years. Does the RF have to keep a lower profile in the lead-up to an election in order not to distract from or show favoritism in the process? I think you are completely right about the visit being delayed because of the election! A very good point! Welcome back, KMR! I truly enjoy your blog and thoughtful commentary and am glad you came back. I’m shocked Kate didn’t carry a clutch! I really like the color and neckline of this suit, but some of the alterations are a bit noticeable. I really like the suit. It feels a bit heavy for June, but I think it looks really nice. I’m glad she’s reaching out even if it seems to have remained a surface level visit. I read that it was only 17 ° celsius in London that day so this suit seems perfectly fine for the chilly weather. Welcome back KMR. I didn’t even read the “parenting” article/comments because I was never a parent (well, except for very spoiled furry babies.) So I just didn’t feel I had anything to say. You write a very well researched blog, and your commentary is more than fair, in my opinion. I am sorry things took their toll on you. I hope you are well rested. It is good to have you back, and Thank You for all that you do. I suppose Kate’s justification for the duplicates is one is sparkly, one is not? She must really love the suit. I often do things like that given my wardrobe choices/price-points I am limited to on my income. If I absolutely love something, I will get a back up if I can afford it and it is available. It’s a little different with shoes, if they are comfortable, I will buy them in every color they come in. (Once again, finances accommodating, of course.) We know Kate doesn’t have to worry about a meddlesome little thing like “budget” or feeding her family. Thank You again, for continuing your wonderful blog. Glad to see your blog back, KMR. As for Kate, to praise her for visiting seems a touch silly since it is praise for doing the right thing. It’s nice she is seemingly not indifferent, but if this were Diana, she would have been there straightaway and adding appearances. The suit seems tight, like she has filled a little and gained a little weight. Skirt is too short, even if it’s pretty. She makes the same previous impression of a girl playing dress-up at going to work because she dos not actuually work, and doesn’t know how to dress. While I appreciate the fact that she did visit the survivors of the attack, I wish she had visited the Manchester victims as well. I read on another blog that given that many of those victims were children or adolescents, Kate could have done art therapy with them and had merged her two supposed passions of mental health and art. I really liked that idea. I also do appreciate that she asked about the mental well-being of the hospital employees. These kinds of attacks take a toll on all those involved. Outfit wise, it is okay. I wish the suit wasn’t as tight or as short. I also don’t understand Kate’s obsession with peplums or her tops poofing out a bit at the natural waist. I personally don’t find it appealing on her body type and just emphasizes how slim she is through the hip area. I think a more streamlined appearance through her torso would be more flattering. Interesting that ITV didn’t cover this visit, AND their chief royal reporter didn’t think it was worth their time covering it when challenged on twitter. For non Brits, ITV/ ITN is our second biggest broadcaster and BBC’s competition. They pretend to be independent yet receive some of our licence fee money. It’s a big deal if they do not cover the royals since they cover every little thing the royals do. BBC won’t be far behind. And that will be a nail in the royal coffin to oblivion, pun unintended. Kate as a future Queen Consort has always been a person of interest in their coverage, but apparently they do not think she is worth covering any more. And the excuse the reporter gives that other senior royals had been covered is lame considrring other royals went to different locations and focused on different aspects of the attacks. Kate’s visit fits in with the strategy the family appears to be using in response to these attacks (3 in 3mths). If it was various royals visiting the same location his comments and the decision not to cover might be understandable. …but it looks like Kate has lowered expectations to non coverage. It’s an interesting development if it continues. I think that is really interesting. Did he really mean they aren’t going to cover her visits going forward? That would be really something. I got the impression they felt she didn’t bring anything else to the table this time. William and Kate need to consolidate their (for lack of a better term) fan base now. Because those are the people whose support they will need later. And if media reporting on Kate doesn’t think she brings enough to actually report on, well that is something that should be taken seriously by their office. It’s really excellent constructive criticism when you think about it. If you want attention to be paid to your patronages and what you do, then make it attention-worthy. And photo-ops and waves don’t cut it all the time. I agree bluhare, 6 years in and we still only discuss her fashion and her hair because there isn’t anything else to discuss. I’ve mentioned before that I know more about her charities and the population they are trying to serve, not by anything Kate has said but by the information provided by the various bloggers that cover her. While Chris Ship’s comment might strike some as a bit snarky it really is, as you said, excellent constructive criticism. It is a frank, unvarnished assessment of what Kate brings to the table; judging by the quoted conversations she had, the comment is true to the bone. While terse, it is constructive criticism if Kate and co care to take it on board. I suspect the comfort of palace PR and forelock-tugging papers will see it shrugged off. Eek that bit about “I’m not aware of any significant moments or conversation” funny and brutal. That dude seems a bit petty for not covering Kate’s visit when he covered everyone else’s. It’s not like any of them had significant moments or conversations, they were just nice visits to make people feel better. I wonder if he’s just fed up with the Cambridge’s attitude towards the press. Harry’s not getting a lot of love from that quarter, either. I don’t know if petty is the right word for it. I think he said he hadn’t heard of any significant moments or things she said. I went and looked for the conversation he was having and he didn’t sound petty just that there wasn’t really anything to report on other than she went. Everyone else had soundbites I think. William has the emergency rescue angle to his visit, the Queen is the Queen and so is Charles. Kate’s should have been the mental health angle, but I didn’t see her specifically give any quotes on it. Just that she met staff, patients, and had a panel discussion in about an hour. I am just really surprised ITV, a huge media outlet in Britain, didn’t report on it. I think that’s the big news rather than one reporter’s opinion. His opinion isn’t the issue. It’s the non-reporting because ITV isn’t a tiny outfit that has just one reporter or two on the job. Heck they can purchase reports if they can’t spare anyone from within. It’s the blank refusal to cover Kate, even if his own personal opinion was/is petty. Further to reporting on royals, he tweeted out a RIP for Countess Mountbatten whose death was announced yesterday evening. If anyone is on the margins of royal life according to his reasoning of selective coverage of Kate, it’s Countess Mountbatten. I doubt anyone remembers how she is related to the royals or that the IRA killed her family and the co-relation of that terrorist attack vs Kate’s visit to victims and staff in the aftermath of a terrorist attack. Welcome back KMR. I was concerned that perhaps you were considering discontinuing this blog, which would have made me feel sad. Right now I feel like we are all living in a very stressful time with US politics in turmoil, the terror attacks in London, the huge apartment fire in London and the shooting incidents today in the US and the whole world is on edge. Whatever the circumstances that prompted Kate’s visit to the hospital it was the right thing for her to do. That is all I have to say. Welcome back, KMR. Kate had a nice long break, it’s good that you took a short one, too. I don’t see anything to criticize here. Like Chris Ship, who damns with faint praise, I think that she was dressed appropriately enough, acted caring enough, and provided just enough presence to stem the rising tide of criticism from the royal watchers. While you were on your break, I visited a sugar site. An unprecedented amount of disappointment saturated the comments. Several times I read something to the effect that the poster was once a fan, but now with Kate’s prolonged absence… and the Irish Guards… and shouldn’t she have done something for hospice week… Interestingly, after this hospital visit she regained about 80% of her popularity. I wonder if the Cambridges see it as 100%, though. If they don’t like official reporters and don’t read negative on-line comments, they could be operating under the delusion that they’re doing just enough to get a passing grade from the public. I have a son who was like that in high school. He would sign up for the challenging courses, but only work towards a C. When he slipped a bit, he’d put his head down and bring up his grades, but then soon relax into mediocrity. I explained that I wasn’t willing to fund his attitude after graduation so he enlisted. It didn’t take long for him to realize that he wanted excellence and that working for it was no bad thing. Maybe that’s what the Cambridges need. A royal enlistment. It’s probably too late now, but imagine if they had been held responsible for a full workload as soon as they married? Your son’s story rings true: you reap what you sow. No exceptions, royal or not. The Cambridge’s were given far too much leeway from the get-go, and then milked it for all it was worth. I’d agree, it is too late for them not. Welcome back, and thanks. The research you put into the charities and work different royals do, their significant moments and gems they own does not go unnoticed and I personally am grateful for it. As well as the insight offered by commentors like Herazeus. You’re only one person and you also have a life outside of this blog, this is not your main source of income or only interest so it’s totally understandable that you can’t read and moderate very single comment that’s posted. Thank you for allowing dialogue and trying to keep it above board. I hope we’ll all be well behaved, this blog certainly deserves better than what the comment section was a few posts ago, and what’s occasionally commented on certain posts. Critique and not criticism. It is so great that William , Kate and Harry donated to the victims of the Greenfell tower that crashed in London – they are setting a great example and using their money for a worthy cause! I’m glad your back. I check my email constantly for your posts. BTW, theres a typo in the title, just so you know. There is a typo in the title. Thank you for letting me know. I will fix it. Thank you for keeping your blog. It is the only blog I have ever consistently read and I truly appreciate your insight. First, I want to say thank you to the first responders, and the nurses and doctors in the ER and A&E rooms. Every shift is tough and even worse when you are dealing with a terror attack or a fire, especially one like Grenfell Tower. Yes Kate, support is provided and, from what I have heard from my fireman nephew, the bosses do watch carefully for any signs of PTSD. I suppose it was good that she asked? As for the visit? Sorry but I can’t get over the feeling that she was told to go and that was why it was unplanned. I just don’t get a feeling of empathy from her. Maybe if we saw photos of Kate with the patients I would feel different? I have crappy hearing so have learnt to rely on body language a lot so that what I’m picking up. I actually liked this suit on other wearings, but this time round feel there’s something off about the skirt and the way it is fitting. Like it’s been thrown in the washing machine and it has shrunk a bit? If you look at the photo of Kate taking the big stride, it is pulling which makes me think she’s removed the lining. Hi, Cathy. Missed your post as I have not come back to this thread for a while. First responders and regular citizens who are being so helpful are great! Agree with you! I thought Kate’s comment about PTSD was a bit odd. I read it as if she was asking if it might be possible for victims of such horrors to get PTSD and I thought, “WHAT? Does she ever read anything? Even her notes from HeadsTogether?” Oh, well, maybe it is good that she asked, as you said. Hope you are well and safe where you are. May peace and calm follow you wherever you go. Hate to disappoint you, but Maddie is now Jul – ette all the time That’s what she calls herself. Used to say Liette, but now, Jul-ette. Well, that was my first choice in naming her, so, I am rolling with the punches. As is everyone else. I find it odd that she is choosing her own name so early on. She answers to Maddie, or Madeleine, but when she wants something, she says, Jul-ette this, or Jul-ette that — referring to whatever she seeks. Go, figure. I will admit, though, one of her half-brothers seems to be encouraging her on with this choice. Perhaps, that is the reason for her insistence.